A volcano is an opening, or rupture, in the Earth's surface or crust, which allows hot, molten rock, ash, and gases to escape from deep below the surface. Volcanic activity involving the extrusion of rock tends to form mountains or features like mountains over a period of time. The study of volcanoes is called volcanology, sometimes spelled vulcanology. Volcanoes are generally found where tectonic plates pull apart or come together. A mid-oceanic ridge, like the Mid-Atlantic Ridge, has examples of volcanoes caused by "divergent tectonic plates"—that is, plates pulling apart. The Pacific Ring of Fire has examples of volcanoes caused by "convergent tectonic plates"—that is, plates coming together. By contrast, volcanoes are usually not created where two tectonic plates slide past each other. Volcanoes can also form where the Earth's crust stretches and grows thin, called "non-hotspot intraplate volcanism"—examples include the African Rift Valley, the European Rhine Graben with its Eifel volcanoes, the Wells Gray-Clearwater Volcanic Field, and the Rio Grande Rift in North America. Finally, volcanoes can be caused by "mantle plumes," so-called "hotspots." These hotspots can occur far from plate boundaries, such as the Hawaiian Islands. Interestingly, hotspot volcanoes are also found elsewhere in the Solar System, especially on rocky planets and moons. The term volcano is thought to derive from Vulcano, a volcanic island in the Aeolian Islands of Italy whose name in turn originates from Vulcan, the name of a god of fire in Roman mythology. The Roman name for the island Vulcano has contributed the word for volcano in most modern European languages. At the mid-oceanic ridges, two tectonic plates diverge from one another. New oceanic crust is being formed by hot molten rock slowly cooling down and solidifying. In these places, the crust is very thin due to the pull of the tectonic plates. The release of pressure due to the thinning of the crust leads to adiabatic expansion, and the partial melting of the mantle. This melt causes the volcanism and make the new oceanic crust. The main part of the mid-oceanic ridges are at the bottom of the ocean, and most volcanic activity is submarine. 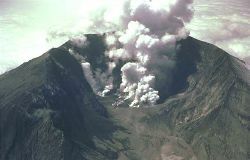 Black smokers are a typical example of this kind of volcanic activity. Where the mid-oceanic ridge comes above sea-level, volcanoes like the Hekla on Iceland are formed. Divergent plate boundaries create new seafloor and volcanic islands. "Subduction zones," as they are called, are places where two plates, usually an oceanic plate and a continental plate, collide. In this case, the oceanic plate subducts (submerges) under the continental plate forming a deep ocean trench just offshore. The crust is then melted by the heat from the mantle and becomes magma. This is due to the water content lowering the melting temperature. The magma created here tends to be very viscous due to its high silica content, so often does not reach the surface and cools at depth. When it does reach the surface, a volcano is formed. Typical examples for this kind of volcano are the volcanoes in the Pacific Ring of Fire, Mount Etna. Hotspots are not located on the ridges of tectonic plates, but on top of mantle plumes, where the convection of Earth's mantle creates a column of hot material that rises until it reaches the crust, which tends to be thinner than in other areas of the Earth. The temperature of the plume causes the crust to melt and form pipes, which can vent magma. Because the tectonic plates move whereas the mantle plume remains in the same place, each volcano becomes dormant after a while and a new volcano is then formed as the plate shifts over the hotspot. The Hawaiian Islands are thought to be formed in such a manner, as well as the Snake River Plain, with the Yellowstone Caldera being the current part of the North American plate over the hotspot. The most common perception of a volcano is of a conical mountain, spewing lava and poisonous gases from a crater in its top. 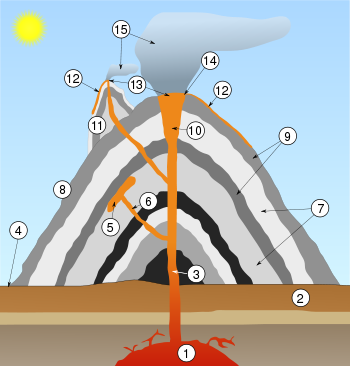 This describes just one of many types of volcano, and the features of volcanoes are much more complicated. The structure and behavior of volcanoes depends on a number of factors. 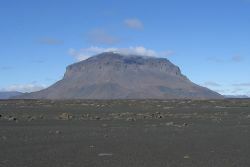 Some volcanoes have rugged peaks formed by lava domes rather than a summit crater, whereas others present landscape features such as massive plateaus. Vents that issue volcanic material (lava, which is what magma is called once it has broken the surface, and ash) and gases (mainly steam and magmatic gases) can be located anywhere on the landform. Many of these vents give rise to smaller cones such as Puʻu ʻŌʻō on a flank of Hawaii's Kīlauea. Other types of volcanoes include cryovolcanos (or ice volcanoes), particularly on some moons of Jupiter, Saturn and Neptune; and mud volcanoes, which are formations often not associated with known magmatic activity. Active mud volcanoes tend to involve temperatures much lower than those of igneous volcanoes, except when a mud volcano is actually a vent of an igneous volcano. Toes of a pāhoehoe advance across a road in Kalapana on the east rift zone of Kīlauea Volcano in Hawaii. A supervolcano is the popular term for a large volcano that usually has a large caldera and can potentially produce devastation on an enormous, sometimes continental, scale. Such eruptions would be able to cause severe cooling of global temperatures for many years afterwards because of the huge volumes of sulfur and ash erupted. They can be the most dangerous type of volcano. Examples include Yellowstone Caldera in Yellowstone National Park, Lake Taupo in New Zealand and Lake Toba in Sumatra, Indonesia. Supervolcanoes are hard to identify centuries later, given the enormous areas they cover. Large igneous provinces are also considered supervolcanoes because of the vast amount of basalt lava erupted. Submarine volcanoes are common features on the ocean floor. Some are active and, in shallow water, disclose their presence by blasting steam and rocky debris high above the surface of the sea. Many others lie at such great depths that the tremendous weight of the water above them prevents the explosive release of steam and gases, although they can be detected by hydrophones and discoloration of water because of volcanic gases. Even large submarine eruptions may not disturb the ocean surface. 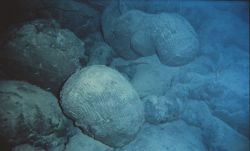 Because of the rapid cooling effect of water as compared to air, and increased buoyancy, submarine volcanoes often form rather steep pillars over their volcanic vents as compared to above-surface volcanoes. In due time, they may break the ocean surface as new islands. Pillow lava is a common eruptive product of submarine volcanoes. Herðubreið, one of the tuyas in Iceland. Subglacial volcanoes develop underneath icecaps. They are made up of flat lava flows atop extensive pillow lavas and palagonite. When the icecap melts, the lavas on the top collapse leaving a flat-topped mountain. Then, the pillow lavas also collapse, giving an angle of 37.5 degrees. These volcanoes are also called table mountains, tuyas or (uncommonly) mobergs. Very good examples of this type of volcano can be seen in Iceland, however, there are also tuyas in British Columbia. The origin of the term comes from Tuya Butte, which is one of the several tuyas in the area of the Tuya River and Tuya Range in northern British Columbia. Tuya Butte was the first such landform analyzed and so its name has entered the geological literature for this kind of volcanic formation. The Tuya Mountains Provincial Park was recently established to protect this unusual landscape, which lies north of Tuya Lake and south of the Jennings River near the boundary with the Yukon Territory. If the erupted magma contains a high percentage (more than 63 percent) of silica, the lava is called felsic. Felsic lavas (or rhyolites) tend to be highly viscous (not very fluid) and are erupted as domes or short, stubby flows. Viscous lavas tend to form stratovolcanoes or lava domes. Lassen Peak in California is an example of a volcano formed from felsic lava and is actually a large lava dome. If the erupted magma contains 52-63 percent silica, the lava is of intermediate composition. These "andesitic" volcanoes generally only occur above subduction zones (for example, Mount Merapi in Indonesia). Some erupted magmas contain up to 45 percent silica and produce lava called ultramafic. Ultramafic flows, also known as komatiites, are very rare; indeed, very few have been erupted at the Earth's surface since the Proterozoic, when the planet's heat flow was higher. They are (or were) the hottest lavas, and probably more fluid than common mafic lavas. 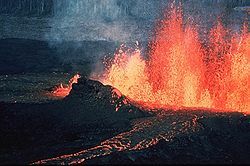 Two types of lava are named according to the surface texture: ʻAʻa (pronounced IPA [ʔaʔa]) and pāhoehoe (pronounced [paːho͡eːho͡eː]), both words having Hawaiian origins. 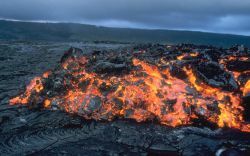 ʻAʻa is characterized by a rough, clinkery surface and is what most viscous and hot lava flows look like. However, even basaltic or mafic flows can be erupted as ʻaʻa flows, particularly if the eruption rate is high and the slope is steep. 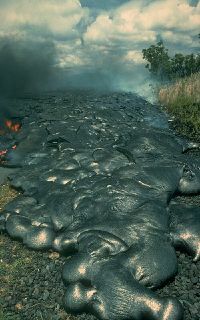 Pāhoehoe is characterized by its smooth and often ropey or wrinkly surface and is generally formed from more fluid lava flows. Usually, only mafic flows will erupt as pāhoehoe, since they often erupt at higher temperatures or have the proper chemical make-up to allow them to flow at a higher fluidity. Mount St. Helens in 1980, shortly after the eruption on May 18. There is no real consensus among volcanologists on how to define an "active" volcano. The lifespan of a volcano can vary from months to several million years, making such a distinction sometimes meaningless when compared to the lifespans of humans or even civilizations. For example, many of Earth's volcanoes have erupted dozens of times in the past few thousand years but are not currently showing signs of eruption. Given the long lifespan of such volcanoes, they are very active. By our lifespans, however, they are not. Complicating the definition are volcanoes that become restless (producing earthquakes, venting gases, or other non-eruptive activities) but do not actually erupt. Scientists usually consider a volcano active if it is currently erupting or showing signs of unrest, such as unusual earthquake activity or significant new gas emissions. Many scientists also consider a volcano active if it has erupted in historic time. It is important to note that the span of recorded history differs from region to region; in the Mediterranean, recorded history reaches back more than 3,000 years but in the Pacific Northwest of the United States, it reaches back less than 300 years, and in Hawaii, little more than 200 years. 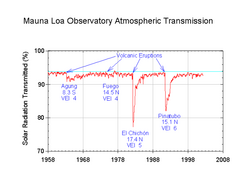 The Smithsonian Global Volcanism Program's definition of 'active' is having erupted within the last 10,000 years. Dormant volcanoes are those that are not currently active (as defined above), but could become restless or erupt again. Confusion however, can arise because many volcanoes which scientists consider to be active are referred to as dormant by laypersons or in the media. Extinct volcanoes are those that scientists consider unlikely to erupt again. Whether a volcano is truly extinct is often difficult to determine. Since "supervolcano" calderas can have eruptive lifespans sometimes measured in millions of years, a caldera that has not produced an eruption in tens of thousands of years is likely to be considered dormant instead of extinct. For example, the Yellowstone Caldera in Yellowstone National Park is at least two million years old and hasn't erupted violently for approximately 640,000 years, although there has been some minor activity relatively recently, with hydrothermal eruptions less than 10,000 years ago and lava flows about 70,000 years ago. For this reason, scientists do not consider the Yellowstone Caldera extinct. In fact, because the caldera has frequent earthquakes, a very active geothermal system (i.e., the entirety of the geothermal activity found in Yellowstone National Park), and rapid rates of ground uplift, many scientists consider it to be an active volcano. The planet Venus has a surface that is 90 percent basalt, indicating that volcanism played a major role in shaping its surface. The planet may have had a major global resurfacing event about 500 million years ago from what scientists can tell from the density of impact craters on the surface. Lava flows are widespread and forms of volcanism not present on Earth occur as well. Changes in the planet's atmosphere and observations of lightning, have been attributed to ongoing volcanic eruptions, although there is no confirmation of whether or not Venus is still volcanically active. In 1989 the Voyager 2 spacecraft observed cryovolcanos (ice volcanoes) on Triton, a moon of Neptune, and in 2005 the Cassini-Huygens probe photographed fountains of frozen particles erupting from Enceladus, a moon of Saturn. The ejecta may be composed of water, liquid nitrogen, dust, or methane compounds. Cassini-Huygens also found evidence of a methane-spewing cryovolcano on the Saturnian moon Titan, which is believed to be a significant source of the methane found in its atmosphere. It is theorized that cryovolcanism may also be present on the Kuiper Belt Object Quaoar. There are many different kinds of volcanic activity and eruptions: phreatic eruptions (steam-generated eruptions), explosive eruption of high-silica lava (e.g., rhyolite), effusive eruption of low-silica lava (e.g., basalt), pyroclastic flows, lahars (debris flow) and carbon dioxide emission. All of these activities can pose a hazard to humans. Earthquakes, hot springs, fumaroles, mud pots and geysers often accompany volcanic activity. The concentrations of different volcanic gases can vary considerably from one volcano to the next. 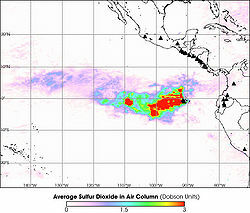 Water vapor is typically the most abundant volcanic gas, followed by carbon dioxide and sulphur dioxide. Other principal volcanic gases include hydrogen sulphide, hydrogen chloride, and hydrogen fluoride. A large number of minor and trace gases are also found in volcanic emissions, for example hydrogen, carbon monoxide, halocarbons, organic compounds, and volatile metal chlorides. Large, explosive volcanic eruptions inject water vapor (H2O), carbon dioxide (CO2), sulfur dioxide (SO2), hydrogen chloride (HCl), hydrogen fluoride (HF) and ash (pulverized rock and pumice) into the stratosphere to heights of 10-20 miles above the Earth's surface. The most significant impacts from these injections come from the conversion of sulphur dioxide to sulphuric acid (H2SO4), which condenses rapidly in the stratosphere to form fine sulfate aerosols. The aerosols increase the Earth's albedo—its reflection of radiation from the Sun back into space - and thus cool the Earth's lower atmosphere or troposphere; however, they also absorb heat radiated up from the Earth, thereby warming the stratosphere. Several eruptions during the past century have caused a decline in the average temperature at the Earth's surface of up to half a degree (Fahrenheit scale) for periods of one to three years. The sulphate aerosols also promote complex chemical reactions on their surfaces that alter chlorine and nitrogen chemical species in the stratosphere. This effect, together with increased stratospheric chlorine levels from chlorofluorocarbon pollution, generates chlorine monoxide (ClO), which destroys ozone (O3). As the aerosols grow and coagulate, they settle down into the upper troposphere where they serve as nuclei for cirrus clouds and further modify the Earth's radiation balance. Most of the hydrogen chloride (HCl) and hydrogen fluoride (HF) are dissolved in water droplets in the eruption cloud and quickly fall to the ground as acid rain. The injected ash also falls rapidly from the stratosphere; most of it is removed within several days to a few weeks. Finally, explosive volcanic eruptions release the greenhouse gas carbon dioxide and thus provide a deep source of carbon for biogeochemical cycles. Many ancient accounts ascribe volcanic eruptions to supernatural causes, such as the actions of gods or demigods. 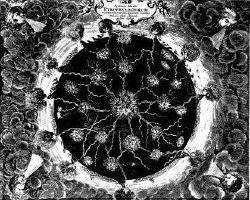 One early idea counter to this was Jesuit Athanasius Kircher (1602-1680), who witnessed eruptions of Aetna and Stromboli, then visited the crater of Vesuvius and published his view of an Earth with a central fire connected to numerous others caused by the burning of sulfur, bitumen and coal. The volcano appears as a charge in heraldry. ↑ M. A. Wieczorek, B. L. Jolliff, A. Khan, M. E. Pritchard, B. P. Weiss, J. G. Williams, L. L. Hood, K. Righter, C. R. Neal, C. K. Shearer, I. S. McCallum, S. Tompkins, B. R. Hawke, C. Peterson, J, J. Gillis, and B. Bussey, "The Constitution and Structure of the Lunar Interior." Reviews in Mineralogy and Geochemistry 60(1) (2006): 221-364. ↑ D. L. Bindschadler, Magellan: A new view of Venus' geology and geophysics. Reviews of Geophysics, July 1995. Retrieved May 18, 2018. ↑ Glacial, volcanic and fluvial activity on Mars: latest images European Space Agency, February 25, 2005. Retrieved May 18, 2018. ↑ Exceptionally Bright Eruption on lo Rivals Largest in Solar System. W. M. Keck Observatory, November 13, 2002. Retrieved May 18, 2018. ↑ Cassini Finds an Atmosphere on Saturn's Moon Enceladus. Jet Propulsion Laboratory. Retrieved May 18, 2018. ↑ David L Chandler, Hydrocarbon volcano discovered on Titan New Scientist, June 8, 2005. Retrieved May 8, 2018. 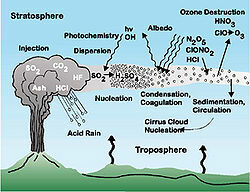 ↑ Volcanic gases can be harmful to health, vegetation and infrastructure U.S. Geological Survey. Retrieved May 18, 2018. Sigurðsson, Haraldur (ed.) Encyclopedia of Volcanoes. Burlington, MA: Academic Press, 1999. ISBN 012643140X This is a reference aimed at geologists, but many articles are accessible to non-professionals. Smithsonian Institution - Global Volcanism Program. How Volcanoes Work by Tom Harris. How Volcanoes Work - Educational resource on the science and processes behind volcanoes, intended for university students of geology, volcanology and teachers of earth science. Natural Disasters - Volcano Great research site for kids. This page was last modified on 18 May 2018, at 20:55.